Home / Stock Picks / Hot Stocks / Will Blue Apron Stock Be Delisted Soon? It’s really hard for me to think of a more disappointing stock than Blue Apron (NASDAQ:APRN). Before names like Fitbit (NYSE:FIT), GoPro (NASDAQ:GPRO) and countless others bit the dust, they had impressive rallies first. Blue Apron stock price, on the other hand, has never jumped significantly. APRN stock has gone down in nearly a straight line. The company priced its IPO at $10 per share and closed about flat on its first day of public trading. That should have been the first warning sign. It has literally never traded higher than it did on its first day. Now at $1.17, Blue Apron stock is down 88% from its IPO less than 16 months ago. Seriously, can anyone think of a worse performer? Sears (NASDAQ:SHLD) has done worse during the same period, but only slightly, as it has fallen over 94%. While that’s 650 basis points worse than APRN, remember that SHLD is going bankrupt. Blue Apron has to be one of the worst IPOs of all time. Will Blue Apron Stock Be Delisted? If Blue Apron stock price drops below $1, the countdown to delisting will begin. On both the Nasdaq and NYSE, once a stock falls below $1 per share and trades below that mark for 30 consecutive days, the delisting process begins. So then what? If Blue Apron closes below $1 and stays below that mark for 30 consecutive days, then the company will have 180 calendar days to get Blue Apron stock price above $1. If that doesn’t happen, then Blue Apron stock can be delisted. Could it happen? Absolutely. While it may seem unlikely, simply look at the trajectory of APRN stock. It’s down 88% in 16 months. Last quarter, Blue Apron’s losses shrank year-over-year and its EBITDA actually topped consensus expectations. However, Blue Apron is getting there by cutting customers, as its customer count plunged 24% year-over-year and 9% quarter-over-quarter. Ouch. Those numbers are ugly, and they are causing revenue estimates to dive. Analysts now expect Blue Apron’s sales to fall 21% year-over-year. And even though analysts on average expect Blue Apron’s earnings to jump 57% this year, the average estimate still calls for APRN stock to lose 71 cents per share. APRN doesn’t have much, if any, room for error and it looks like Blue Apron stock is on life support. The one saving grace that Blue Apron stock has is M&A. With a market cap below $250 million, it would be very easy for many companies to buy APRN at this point. Is anyone likely to come forward? Maybe. But what if an acquirer lets Blue Apron stock fall another 50% first? Then APRN would have virtually no choice but to accept an offer, which could come in at $200 million or less. That’s a far cry from its IPO value of $1.9 billion. While many like to speculate about Amazon (NASDAQ:AMZN) buying APRN, I don’t think it needs to do so. With Whole Foods and Prime, Amazon seems okay on the food-ordering front. APRN wouldn’t really be a good fit for Costco Wholesale (NASDAQ:COST), but a name like Kroger (NYSE:KR), Target (NYSE:TGT) or Walmart (NYSE:WMT) could consider buying APRN in order to acquire customers and build out a stickier ecosystem. At this point, I wouldn’t be a buyer or a seller of Blue Apron stock. It’s simply too risky to short a stock “into the hole” as it nears the $1 mark. 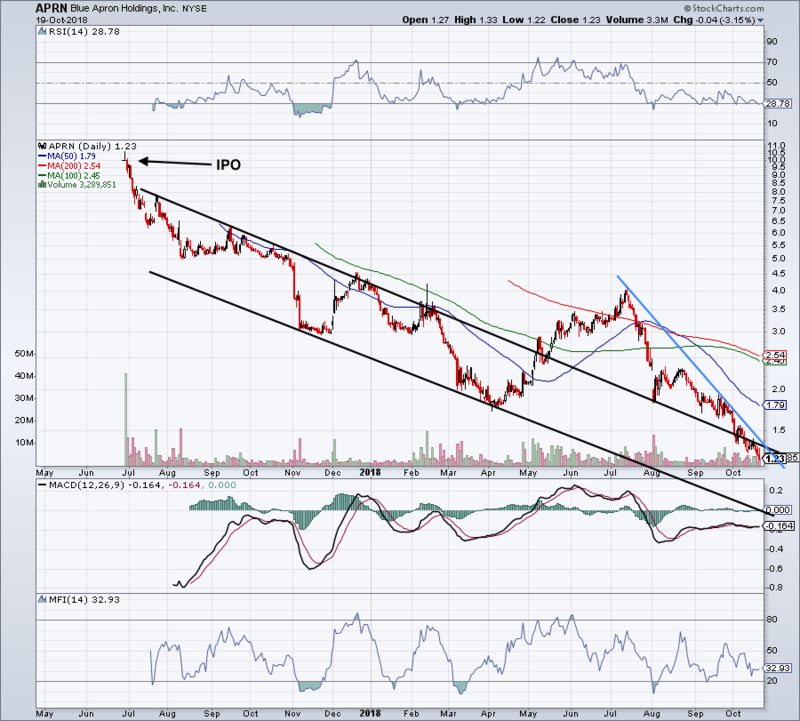 At these low levels, APRN stock could jump 30% or 40% far too easily. But before buying Blue Apron stock, I would need to know that the company has a sound business. And that’s certainly not the case now. 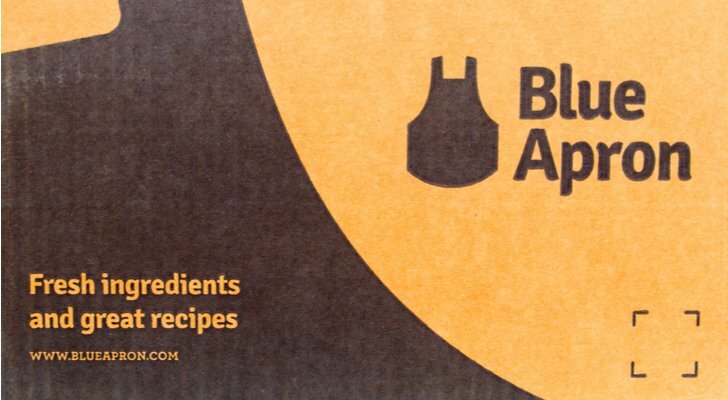 Article printed from InvestorPlace Media, https://investorplace.com/2018/10/will-blue-apron-stock-be-delisted-soon/.